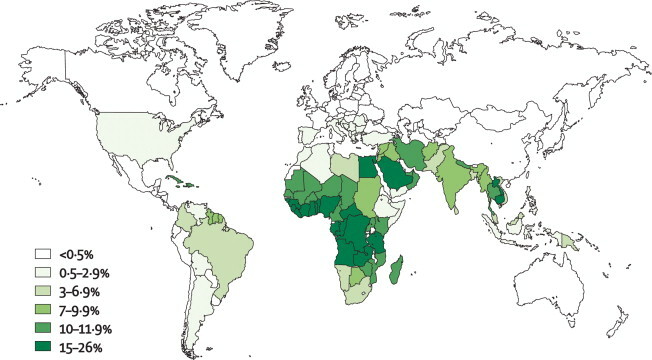 Glucose 6 phosphate dehydrogenase (G6PD) deficiency affects approximately 400 million individuals worldwide. It is the most common human enzyme defect. 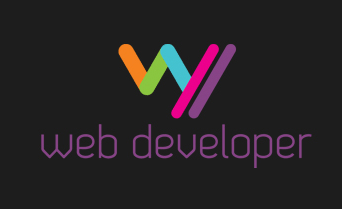 The global distribution of this disorder is remarkably similar to that of malaria, lending support to the so-called malaria protection hypothesis. It is common in Africa, around the Mediterranean, and in the Orient. 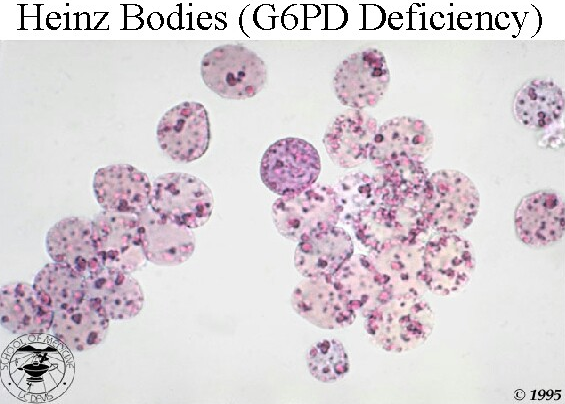 G6PD deficiency is an X-linked recessive disorder. The hereditary genetic defect is due to mutations in the G6PD gene, which cause functional variants with many biochemical and clinical phenotypes. The most frequent clinical manifestations of G6PD deficiency are neonatal jaundice, and acute hemolytic anemia, which is usually triggered by an exogenous agent. Some G6PD variants cause chronic hemolysis, leading to congenital non-spherocytic hemolytic anemia. The intermittent hemolysis seen in G6PD deficiency may be provoked by drugs (e.g. Antimalarial drugs, Aspirin & NSAIDs, Nitrofurantoin, Quinidine, Quinine, Sulphonamides), certain foods (such as fava beans), infections or other acute illnesses. In Negroes the disease is self-limiting as reticulocytes have normal enzyme activity; this is not the case in Mediterranean and Oriental varieties. Complete blood cell count (FBC) and reticulocyte count. Indirect and direct bilirubin level. Abdominal ultrasound may be useful in assessing for splenomegaly and gallstones. These complications are typically limited to patients with severe chronic hemolysis. A quantitative analysis of G6PD activity in a leukocyte-depleted sample is definitive. Testing for enzyme activity should be performed when patients are in remission, as results may be falsely negative during acute hemolysis. 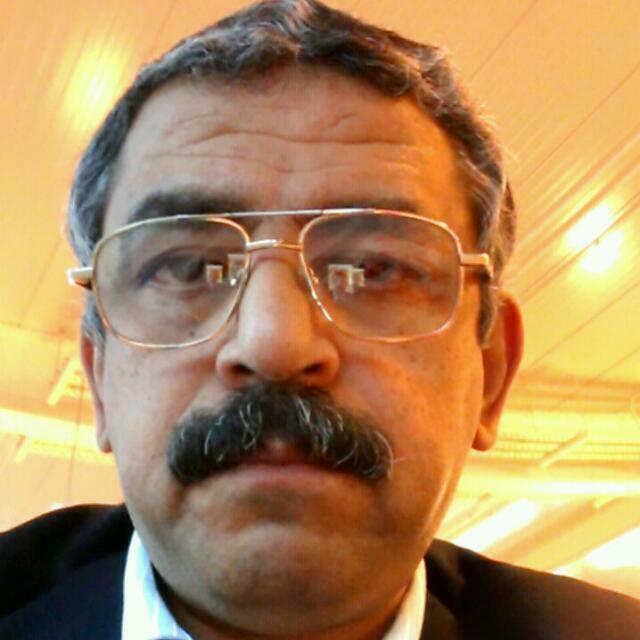 The reason is that older erythrocytes have been destroyed because their diminished G6PD levels leave them vulnerable to hemolysis while there is a compensatory increase of immature erythrocytes and reticulocytes that have increased G6PD levels. 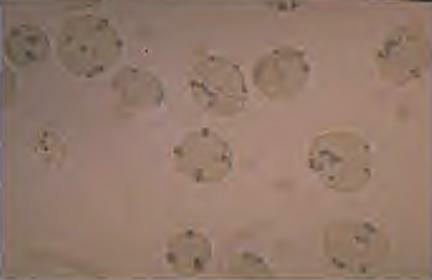 There is anemia, evidence of intravascular hemolysis (reticulocytosis, raised LDH, raised indirect bilirubin, low serum haptoglobin, fragmented RBCs in peripheral blood smear, and hemoglobinuria/hemosiderinuria), and Heinz bodies in a peripheral smear stained with a supravital stain (note their location in close proximity to cell membrane). 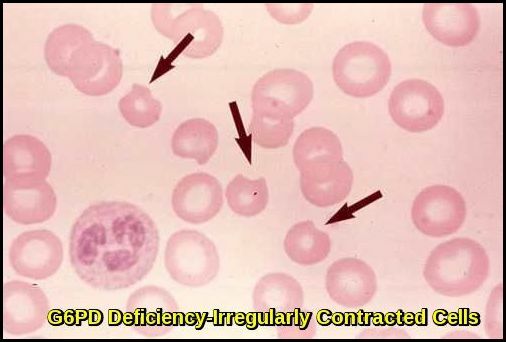 There is a simple screening test for G6PD deficiency but care must be taken in Negroes with a reticulocytosis to avoid false negative results. G6PD activity is higher in premature infants than in term infants. This should be considered when testing for G6PD deficiency in infants. G6PD can also be measured spectrophotometrically and the enzyme detected on electrophoretic gels. Screening for G6PD deficiency is indicated in patients with a suggestive family history or in geographical areas with a high prevalence of the disorder. This is primarily the avoidance of factors that precipitate hemolysis. Patients should be taught to avoid drugs and chemical exposures that can cause oxidant stress. Patients should also avoid broad beans (ie, fava beans). Favism occurs primarily in the Mediterranean variety of G6PD deficiency. Anemia should be treated with appropriate measures, recognizing that hemolysis is self-limited and often resolves in 8 to 14 days. Infants with prolonged neonatal jaundice as a result of G6PD deficiency should receive phototherapy. Exchange transfusion may be necessary in cases of severe neonatal jaundice or hemolytic anemia caused by favism. Patients with chronic hemolysis should be placed on daily folic acid supplements. Nkhoma ET, Poole C, Vannappagari V, Hall SA, Beutler E. The global prevalence of glucose-6-phosphate dehydrogenase deficiency: a systematic review and meta-analysis. Blood Cells Mol Dis. 2009 May-Jun. 42(3):267-78. Luzzatto L, Nannelli C, Notaro R. Glucose-6-Phosphate Dehydrogenase Deficiency. Hematol Oncol Clin North Am. 2016 Apr. 30 (2):373-93. Frank JE. Diagnosis and management of G6PD deficiency. Am Fam Physician. 2005 Oct 1. 72(7):1277-82. Glucose 6 phosphate dehydrogenase G6PD deficiency affects approximately 400 million individuals worldwide. It is the most common human enzyme defect.